“Amusing Ourselves to Death,” proclaimed the title of media scholar Neil Postman’s influential 1985 book, which took aim at the deleterious impact of television on American discourse. Nearly 30 years later, based on two movies out this week, Postman’s thesis seems prime for an update. These days, it’s not so much that the media is destroying discourse so much as it’s consuming our identities. It all starts with Jake Gyllenhaal’s face — and it ends with Jean-Luc Godard’s dog. 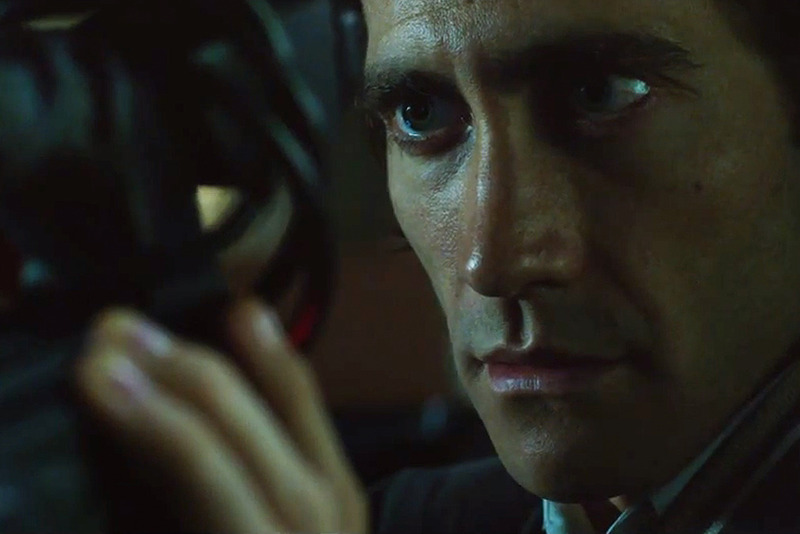 In “Nightcrawler,” which opens nationally this week, Gyllenhaal delivers his best performance to date. As Lou Bloom, the wide-eyed careerist willing to do anything and everything to achieve professional success, Gyllenhaal’s wide-eyed gaze and penchant for speaking in sharp, polished soundbites result in a genuinely modern form of movie monster. Furthering that perception, Lou basically comes out of nowhere in the shadowy opening scene, and his origins remain a mystery throughout. We first meet the character as he accosts a police officer in a dark alley on the outskirts of Los Angeles for the sole purpose of stealing his watch. But when Lou comes across an accident on the freeway that evening, his priorities shift: Witnessing the presence of camera-wielding freelancers keen on selling their footage of the chaos to local networks, Lou makes a silent commitment to perfect the job himself. In fact, though he talks a lot, the essence of Lou’s motives are invisible. Everything he says and does stems from hidden calculation, which intensifies the dread surrounding his intentions. In writer-director Dan Gilroy’s remarkably accomplished debut, the city becomes a playground for a wicked force willing to take advantage of its vulnerabilities. The letters “TMZ” never enter the screenplay, but they’re hovering just outside the frame. Lou manages to sell his footage for one local channel by appealing to the desperations of an older producer (Rene Russo) who needs to sell the misleading narrative of “urban crime seeping into the suburbs” in order to keep her flagging ratings up. With a clueless young assistant (an effectively fragile Riz Ahmed) in tow, Lou not only manages to steamroll his competition, but eventually plays a role in the footage he seeks out — futzing around with the composition of a car crash and invading a private residence in the aftermath of a murder before the police arrive. He’s so slick, well-spoken and oddly charismatic that “Nightcrawler” dares you to root for him to get away with it — and leaves you to contemplate the paradox of that feeling. I’ve seen the movie twice, and on both occasions certain key moments that showcase Lou’s savvy talents garner both laughter and applause. He’s an insatiably power-hungry villain, but he moves and talks with such compelling rhythms that it’s impossible not to get seduced by his charm. “A friend is a gift you give yourself,” he tells the network producer after essentially blackmailing her into sleeping with him — and despite the awful implications, by enjoying Lou’s presence, viewers must agree. Later, a violent sequence of events that Lou sets in motion convey the rush of excitement associated with nimbly choreographed action, but their immoral context is at odds with the immediacy of their payoff. Lou’s psychotic tendency to capitalize on the pain of others, exploiting the desire for sensationalist material. The whole thing turns him into a menacing physical embodiment of our vulnerable times. It’s no longer just the media that drags the discourse through the mud by emphasizing and distorting terrible events for the sake of entertainment — it’s us, not only complicit as consumers but as content creators as well. If “Nightcrawler” suggests we’re recording ourselves to death, Jean-Luc Godard’s newly released 3-D feature “Goodbye to Language” argues that we’re already in the afterlife. A fragmented, essayistic pileup of small moments involving a struggling young couple, “Goodbye to Language” plays with its format to delirious effect. In an astounding shot, a woman walks in and out of frame in one visual channel while the other moves in the opposite direction, literally depicting moving images at war with each other. 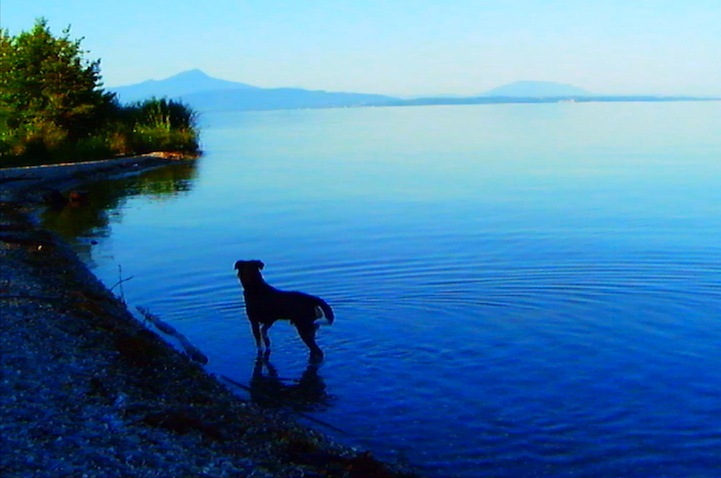 For some viewers, Godard’s provocations register as little more than unstable eye candy, but with these moments, “Goodbye to Language” feels unmistakably contemporary — a treatise on the capacity for technology to overcome the boundaries of human logic. Still not convinced? Look no further than an interview that Godard gave to a Swiss television network in the days prior to movie’s premiere at Cannes — some of the only press the notorious recluse actually delivered for the release — when he offered his perspective on new media. “Do you know what ‘SMS’ stands for?” he asked, referring to acronym for text messages. 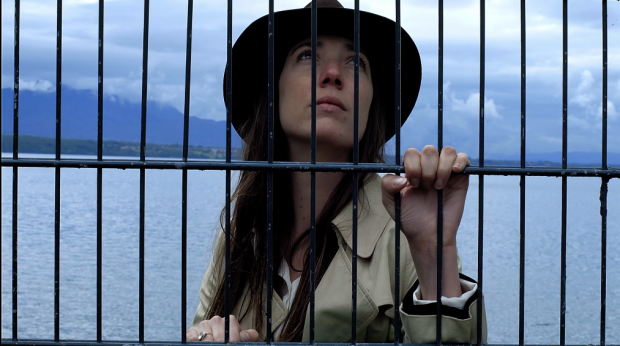 His answer: “Save my soul.” The new movie embraces that plea, as if Godard has gone searching for the human element in an environment awash in digital overload. “Goodbye to Language” unfolds in fragments of meanings rushing across the screen: a sea of text, voiceover, and unsteady visuals that exist, above all else, in the unsteadiness of a society on the verge of collapse. That’s not a new theme for the capitalism-averse Godard, but there’s a greater empathy at work here than one usually finds in the French New Wave auteur’s work. It’s no wonder that the director’s dog, Roxie, emerges as the movie’s ultimate hero: The cutaways to the canine mark the only scenes in “Goodbye to Language” where the narrative comes into focus. Roxie eventually abandons his owners in the movie’s climax, and considering everything leading up to that moment, one can hardly blame him. He ventures out to a place beyond the constraints of civilization, where personal satisfaction melds with the tranquility of nature. Behind him lie the perils of self-involvement and confusion. It’s Lou Bloom’s world, we’re just living in it, and the scariest part about it is that we like it.